Axis Technolabs is best android app Development company. We are help to build your business ideas to reality for your mobile application. With latest mobile app technologies your mobile app defiantly growing your business . We have well trained and 4+ year expert android developers for providing our clients services. We are serving app development services in 10+ countries. 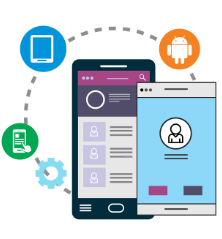 We have a special and expert team for android design and development, Developer always proficient app and strategist build who use high quality and Develop the best understanding of clients projects demands, scope of work and deliver app on deadline, our dedicated android developers implement Agile methodologies on each App. we have enterprise and start-up client’s solutions to business profit via app development and our successfully App delivery ratio is 100% and countries wise client satisfied 98%. The most advantage of programming for Android app development which is extremely simply set up app design from scratch. We have best Experienced team of app designers, developers and QA. Google certified developers, they help to build your dream app as well best project managers are support to all time. check it our portfolio we are always delivered best android app. Advantage of Axis Technolabs Android Development Approach? Why we as a Mobile App Development? We are one of the Best Android app development company in USA, India. We are providing bug free Apps to our clients within time-line . We have also Excellent Analytic and problem solving skills. We are working with different Categories like Gaming, Education, Business, Tours & Travel, Pharmaceutical, Entertainment and m-Commerce Apps, food & drinks. What Can We Do Help for You? Are You looking to Create Android App or Have an Idea for an android mobile Application? Hire Android app developer help to the experience, expertise, exposure to possibilities and a chance to grip the end user of the application. We are always help to launch your android app on playstore. Let us Help you and Build the Required Android Mobile App Development.